This blog is about all things related to flags – their care, their history – the vexingly vexillological. The mid-West in the years leading up to and after the Civil War were wild and woolly. These were the border lands whose laws were dictated, in part, by federal politics and cut and paste compromises as much as civic law, vigilante law, and lawlessness. In 1835, J. Wilkison Reno marries Julia Ann Freyhafer. Together, on their 1200 acre farm in Seymour, Indiana, they raise 6 children: Frank, John, Simeon, Bill, Clint, and their daughter, Laura. Despite the Reno's strict upbringing which included studying the Bible all day every Sunday, four of the six became outlaws. All, it seems, were troubled: Laura was considered as wild as her brothers and "Honest Clint" eventually earned his own arrest record later in life for assault, gaming, and allegedly running a house of prostitution (source: findagrave.com). Clint would end his days in an asylum in Topeka, Kansas committed by his Quaker wife, Anna Collins. 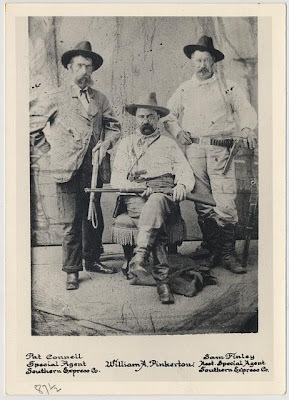 In their day, the members of the Reno Brothers Gang were infamous. Before they were infamous, they were plain old scary. The gang was headed by Frank and John Reno, included younger brothers, Simeon and Bill Reno, and a changing cast of ne'er-do-wells. Their crimes started early with systematically setting up crooked card games. Soon they graduated to theft and arson. They stole horses. They bullied. They robbed. They assaulted people with impunity. If they wanted something, they took it. And if that meant they had to kill someone, it didn't seem to matter. "Be wary of thieves and assassins that infest the place." The gang was based at the Radar House hotel in Seymour, Indiana (population: 2,500) but their influence was felt in five different states. How bad was it? In early 1866, a beheaded body was found floating in the White River in Seymour. Both citizens and the law were too intimidated to prosecute the gang and so, they terrorized local communities (legendsofamerica.com). The Reno Gang's claim to fame, however, is that they are responsible for the first great American train robbery. What made the robbery "great" was that they are the first to rob a moving train and to net nearly $100,000 for their trouble. Some sources credit the Reno Gang for inspiring other train robbers such as Butch Cassidy and, of course, the Sundance Kid. 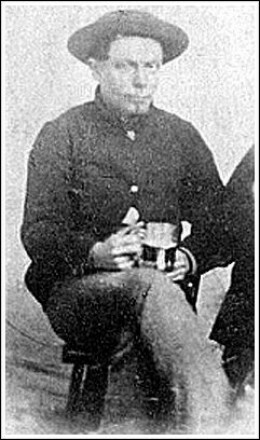 During the Civil War, Frank and John Reno were Union Army "bounty jumpers" – men who signed up for the enlistment fee then disappeared only to re-enlist elsewhere under a different name, collect a new fee, and so on. You also can consider them deserters. It is unclear if Simeon Reno was a bounty jumper; he definitely was a deserter. William Reno apparently deserted for a brief enough time to return and be granted an honorable discharge from the army. He is the only Reno brother to have this distinction. The first train they robbed was an eastern bound Ohio and Mississippi train that was crossing Indiana the night of Oct. 6, 1866. The robbery was unique in that they actually robbed the train at night and they did it while the train was moving ("The Express Robberies" New York Times Aug. 26, 1868). John Reno, Simeon Reno, and Frank Sparks hopped the train in Seymour, Indiana while the rest of the gang followed on horseback. The trio managed to crack one safe which had, according to different accounts, $13,000 or $16,000 in it. They also pushed a second, larger safe overboard where the other gang members were waiting. While the gang was busy trying to open this safe, a posse was able to form and scare them off. 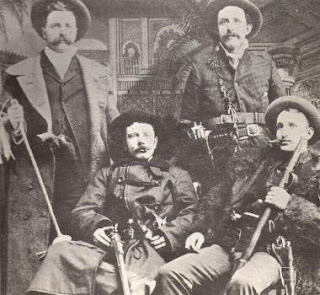 A year later on Nov. 17, 1867, the Reno Gang robbed a courthouse in Gallatin, Missouri. In December, 1867, they robbed another train, coming away with $8,000. In February and March of 1868, the gang moved to Iowa and started off the new year with three more robberies. One included stealing $14,000 from the Harrison County Treasury. Another included stealing $12,000 from the Mills County Treasury the day after they robbed the Harrison County Treasury. Meanwhile, that March, the irate citizens of Seymour, Indiana had formed a vigilante group, the Southern Indiana Vigilance Committee, whose sole purpose was to capture and hang the gang. Pinkerton detectives, however, caught part of the gang (Frank Reno, Miles Ogle, and Albert Perkins) that same month. Amazingly, they managed to break out of jail in April. Then, back in Indiana, they boldly robbed another train on May 22, 1868 by stealing the engine, the tender and an express car (New York Times front page July 25, 1868). The robbery ended up killing one guard but netting the gang $96,000 and national fame. On July 9, 1868, they tried to rob another train but were ambushed by 10 Pinkerton detectives. Even so, all but one gang member escaped. The one who was caught traded information about the gang in exchange for a more lenient sentence. While his information led to the capture of two more gang members, it turns out that all three of the captured gang members were abducted by masked vigilantes and hung. Then three more gang members were caught and hung by vigilantes. Same town. Same tree. And so it went: The gang was caught piecemeal and jailed with each jailing accompanied by an attempt at vigilante justice. At some point prior in 1868, John Reno was caught for the Gallatin robbery (again, by Pinkertons), and sentenced to jail for 25 years of hard labor (New York Times front page July 25, 1868). Although he was released after serving 11 years, his life of crime was not over. Counterfeiting would be next on his agenda. Meanwhile, in the wee hours of the morning of December 12, 1868 at New Albany, Indiana, a mob of 65 masked vigilantes broke into jail and beat up lawmen in order to get to the jailed members of the Reno Gang. 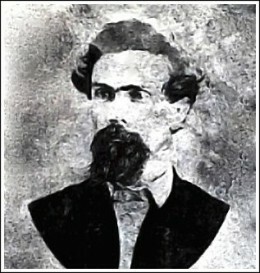 Frank Reno was the first to be hung, then his brothers, William and Simeon. Frank Reno was 31 years old. William Reno was 20, and Simeon Reno was 25. At 4:30 that morning, the last gang member to be hung was Charlie Anderson. No one ever was identified or prosecuted for the hangings, nor has the gang's stolen fortune ever been found (www.seymour.org). 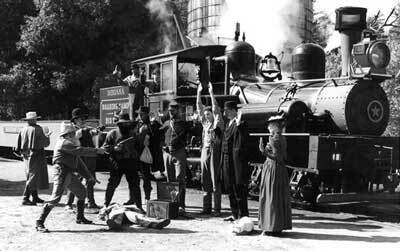 In this film version of the Reno train robbery, the brothers have gone off to war as Confederate soldiers, not as Union bounty jumpers. The war is over. The brothers return home. They believe, however, that the eldest brother (named Vance in the movie) died a war hero. Imagine everyone's surprise when Vance returns home to find his baby brother married to Vance's true love. It's a bit like Shane meets Peyton Place on a Star Trek hollow deck: very sad, very melodramatic, and a total fantasy. Teddy Roosevelt: "Steward of the People"
"Let It Fly!" is sponsored by USFlagstore.com. These flags are made in the USA with American materials and American labor. No kidding (and no outsourcing). The actual blog is written by Scarletpen, a writer with a passion for history and the stories that make history personal, real and alive. Content is the intellectual property of Scarlet Pen writing for USFlagstore.com. Watermark theme. Powered by Blogger.